Since January, Claire’s, Nine West and the Bon-Ton stores have filed for bankruptcy, joining a parade of once-ubiquitous retailers — Macy’s, Sears, Payless, American Apparel, the Limited and Toys “R” Us, to name a few — that have either shuttered scores of stores or gone bankrupt since 2017. The upset in the market has left retail REITs in search of long-term solutions. The Real Deal’s analysis of the acquisitions prominent REITs made over the past five years shows that most have dialed down their purchasing in the last 12 months to the lowest levels seen in the last five years. That was just months before GGP’s bombshell sale to Brookfield Property Partners in March for $15.3 billion. Brookfield already owned 34 percent of GGP — it began buying shares after GGP filed for bankruptcy protection in April 2009. Brookfield is reportedly partnering with a CBRE subsidiary, as well as the California Public Employee Retirement System and the TIAA affiliate TH Real Estate, on the acquisition. The GGP-Brookfield deal reflected a lower-than-expected valuation for GGP, which was thought to be somewhat insulated from the retail carnage because of its focus on Class A space. “In the absence of a competing bidder, there was zero incentive for Brookfield to materially improve their price,” said Alex Goldfarb, managing director of equity research at New York investment banking firm Sandler O’Neill. GGP owns 125 retail properties in the U.S., including Fashion Show in Las Vegas, Park Meadows in Lone Tree, Colorado, Water Tower Place in Chicago, Oakbrook Center in Oak Brook, Illinois, and the Shops at Merrick Park in Coral Gables, Florida. Shares of stocks in competing retail REITs with Class A space plummeted after the announcement of the valuation. “They are trying to figure out a way to jump on consumer data and somehow monetize that,” said Michael Harris, managing director of CREModels, a commercial real estate consulting and technology company based in St. Petersburg, Florida. GGP isn’t alone in feeling the financial pressure in the retail world. In December 2017, Westfield Corporation announced it was being acquired by Unibail-Rodamco, a commercial real estate giant based in France that is Europe’s largest publicly traded real estate company. Westfield, valued at just under $25 billion in the deal, owns and operates 35 properties, including Valley Fair in San Jose, a luxury mall with retailers such as Tiffany & Company, Louis Vuitton, Cartier and Prada, and Westfield London, which is in the midst of a major expansion. Christophe Cuvillier, chief executive of Unibail-Rodamco, said in a statement at the time that the move would enable the company to enter “new and attractive real estate markets.” In the transaction, Westfield investors will receive a combination of cash and shares, with each share valued at $7.55. The deal was expected to close in the first half of this year. In the meantime, Westfield has been moving forward with plans to spin off OneMarket, an innovation arm previously known as Westfield Labs. OneMarket is working on a project that aims to connect every physical retailer in the U.S. and Europe so they can share data. At the same time, the Toys “R” Us bankruptcy is putting pressure on Kimco Realty, a REIT based in New Hyde Park, New York, which owns interests in 475 U.S. shopping centers with 81 million square feet of space. (See our interview with Kimco’s COO, David Jamieson, on page 18.) The firm has been looking for tenants and buyers for 22 Toys “R” Us locations, with Kimco expecting many of the stores to close in the second half of the year. Kimco brought in cash by unloading 21 shopping centers in the first quarter, with the majority of those sold in the Midwest, according to the company’s first-quarter earnings call, but the REIT will still have a national footprint. “Their balance sheet leverage still needs to come down,” said Sandler O’Neill’s Goldfarb. The proposed merger of Rite Aid and Albertsons — if it takes place — will likely improve Kimco’s situation, as the REIT owns about 10 percent of Albertsons, according to Goldfarb. “That will give them the capital they need,” Goldfarb added. Kimco declined to comment for this story. 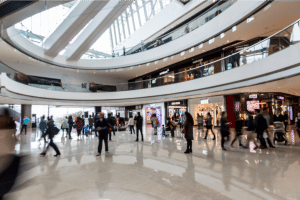 And Macerich, which owns 48 regional shopping centers, including Santa Monica Place in Los Angeles and Tysons Corner Center in Tysons Corner, Virginia, has been contending with occupancy losses tied to retail bankruptcies. The Santa Monica-based REIT had a net loss of $33.6 million in the first quarter and has been facing pressure from activist investors at hedge fund Starboard Value. “It would seem like they are getting ready to have a proxy duel with Starboard,” said Goldfarb, but he added that it was unclear how Starboard would change the way Macerich is operated if it managed to bring in its own board. In a dramatic move toward diversification, Macerich in March announced it had formed a joint venture with Hudson Pacific Properties to turn the L.A. mall Westside Pavilion into office space, with Macerich holding onto 25 percent of the ownership and Hudson Pacific taking the remaining stake. Then in April, Macerich announced that longtime Chairman and CEO Art Coppola was retiring. Tom O’Hern, senior executive vice president and chief financial officer of Macerich, said on the REIT’s first-quarter earnings call that the company was still dealing with the results of a record number of bankruptcies in 2017 but expected the second half of the year to be “strong.” He noted Macerich had signed leases with merchants such as Life Time Athletic, H&M and HomeGoods at some of its properties. Like some of the other major retail REITs, Simon has been involved in the “densification” of big-box stores and department stores in its redevelopment projects. “They are slicing them up and making smaller spaces,” noted CREModels’ Harris. Some REITs, such as Simon Property Group, have spotted opportunity in the churn. Currently, Indianapolis-based Simon owns 209 properties, including the massive King of Prussia Mall near Philadelphia, Roosevelt Field shopping center on Long Island, the Mills at Jersey Gardens in Elizabeth, New Jersey, and the Westchester in White Plains, New York. Simon also owns a number of premium outlet malls, such as Woodbury Common in Central Valley, New York. In recent months, SPG has gone on a redevelopment tear, making the most of retail space that has been vacated. “All of the REITs are starting to go toward more redevelopment, because there’s not much to buy,” said Merrie Frankel, president of Minerva Realty Consultants in New York City. For instance, Simon has been redeveloping five former Sears stores, just as GGP had aimed to do with the Sears properties it acquired last year. Simon’s Sears redevelopments include locations in Toms River, New Jersey, and Ross Park Mall in Pittsburgh. Simon is adding entertainment, fitness facilities and dining pavilions to the sites, making them less dependent on traditional retail. Simon has also started redevelopment of the Southdale Center in Edina, Minnesota, where it is replacing a former department store with a Life Time Athletic location and other amenities, such as specialty shops and restaurants. Simon is also continuing construction on redevelopment and expansion projects at Town Center at Boca Raton and Toronto Premium Outlets. It doesn’t hurt that Simon has $7.5 billion in revolving credit capacity, Frankel said. “Your average REIT probably has a credit line of $500 million to a billion,” she said. With consumers looking for value, outlet malls have been a pocket of growth for retail REITs in recent years, as they’ve largely escaped the problems facing malls because they aren’t focused on big anchor tenants. Simon has in recent months expanded Woodbury Common Premium Outlets and made additions to Allen Premium Outlets in Allen, Texas, the Mills at Jersey Gardens in Elizabeth, New Jersey, and Sawgrass Mills in Sunrise, Florida. The REIT has also been building Denver Premium Outlets in Thornton, Colorado, which is scheduled to open this fall. Meanwhile, Simon is diversifying its portfolio with investments outside of the U.S., too. In Canada, for instance, in addition to expanding Toronto Premium Outlets, it recently opened the 428,000-square-foot Premium Outlet Collection in Edmonton, which it owns 50 percent of. In March, Macerich formed a joint venture with Hudson Pacific Properties to transform most of L.A.’s Westside Pavilion into office space. In the first quarter, Simon also started construction on a 197,000-square-foot outlet center it owns 20 percent of in Cannock, England. And it plans to open Queretaro Premium Outlets in Queretaro, Mexico — where it is a 50 percent owner — in December, and Malaga Designer Outlet in Malaga, Spain — of which it owns 46 percent — in spring 2019. The expansion is paying off. In a statement, David Simon, chairman and CEO, attributed a 4.8 percent increase in net income for the first quarter — to $620.7 million — to growth in income from its properties and the impact of “new developments, redevelopments, expansions and investments.” Simon’s occupancy is at 94.6 percent, and the company reported that retail sales per square foot were $641 for the 12 months ending in March 2018 — an increase of 4.2 percent. Meanwhile, VEREIT — a real estate operating company based in Phoenix that owns and operates single-tenant commercial properties — notched large acquisition volumes owing in part to its $10 billion acquisition of the commercial real estate REIT CapLease. VEREIT’s assets — including office and industrial holdings in addition to retail — total about 4,100 properties with 94.4 million square feet, according to its proxy statement in March. The company’s retail focus “continues to be off-price in e-commerce-resistant sectors represented by tenants such as Hobby Lobby, LA Fitness and Tractor Supply, as well as brands we believe will continue to provide value to customers long-term, such as Bass Pro [and] Cabela’s,” said CEO Glenn Rufrano on the company’s first-quarter earnings call. Another competing REIT, Realty Income, has diversified its portfolio, too, looking to e-commerce-resistant sectors like drugstores, which make up 10.6 percent of rental revenue. “Within our retail portfolio, over 90 percent of our rent comes from tenants with a service, nondiscretionary and/or low price point component to their business,” CEO John Case said in the REIT’s fourth-quarter earnings call in 2017. “We believe these characteristics allow our tenants to compete more effectively with e-commerce and operate in a variety of economic environments. In the meantime, DDR, based in Beachwood, Ohio, is moving forward on a plan to spin off a group of 50 assets into a separate REIT called Retail Value Trust, which will include 38 properties in the continental U.S. and 12 assets in Puerto Rico. The initiative is “moving us closer to the end of the dilutive, deleveraging process,” CEO David Lukes said on the first-quarter earnings call for 2018. New York City-based Brixmor, which owns about 500 properties, is the largest landlord to TJX Companies, the parent of T.J. Maxx, and the Kroger Company. The REIT delivered 2 million feet of new and renewable leases, CEO and President James Taylor said on the REIT’s first-quarter earnings call. And in another bright spot, grocery-anchored shopping centers have been more resistant to the factors that are hurting more traditional shopping centers, a boon to players such as Regency Centers, which owns 425 properties that are focused in affluent and densely populated trade areas. Grocery-anchored shopping centers also tend to include more experiential elements, such as salons and fitness centers, noted Jeff Edison, chairman and CEO of Phillips Edison & Company, a REIT focused on that asset class.